Karen on her way to Abbott Peak – the Illecillewaet Glacier to the left. 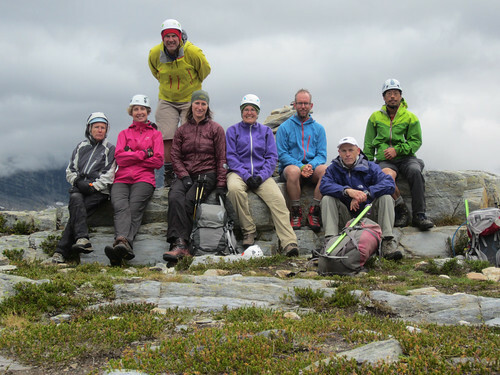 On Aug 19, 2013, Mike and I joined friends from the Alpine Club of Canada (Vancouver Island Chapter — yes, we WERE far from our home base) for a fine hike and scramble up and along the Mt. 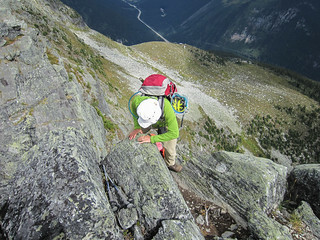 Abbott – Afton traverse in Glacier National Park. This is arguably the most impressive view hike in the Park. One doesn’t even have to gain the summit for amazing vistas of the Mt. Sir Donald group, the Bonney Glacier, the Asulkan group, and the Illecillewaet Glacier — and those are just the leviathans that are right in your face! Take a bit more time and care, gain the the summit of Abbott, and the mountains march on in all directions as far as the eye can see. Views notwithstanding, I particularly enjoyed this hike because it closely follows the footsteps of Arthur Wheeler, who, in 1906, co-founded the Alpine Club of Canada. While I am very proud to be associated with the Club he helped found, it is more than Wheeler’s ACC affiliation that endears him to me. It is the number and quality of large format photographs he took of mountains in Western Canada that holds my deep and abiding interest. Wheeler had the good fortune to survey mountains in areas I know and love, so it has become a particular pleasure of mine to stand where he stood, re-photograph his historic images, and observe how the landscape has changed. From 1894 until 1925 Wheeler was, in one way or another, involved in surveying and making maps of Western Canada. In those days photography came to play a major role in mapping the mountains — traditional rod and chain methods were simply too expensive. Photo-topographical techniques in back then involved taking a panoramic series of mountain landscape photos from a control point that offered excellent views of the surrounding area. The cameras used were bulky and heavy, and the images were exposed on 6 x 4 inch plate glass negatives. Wheeler and the surveys he led produced hundreds and hundreds of these plates. Mary going up Mt. Abbott. Wheeler’s control station for the 1901 images was below on the wide ridge. Wheeler wasn’t alone in the pursuit of making maps with photography in the Canadian west. Indeed, Library and Archives Canada holds over 140,000 glass plates taken from the 1880’s up until the 1950’s. The images produced by Wheeler and other photo-topographic surveyors of the day are outstanding historical documents. Each high resolution, richly detailed image presents us with a snapshot of what these majestic mountain environments looked like over 55 to 125 years ago. 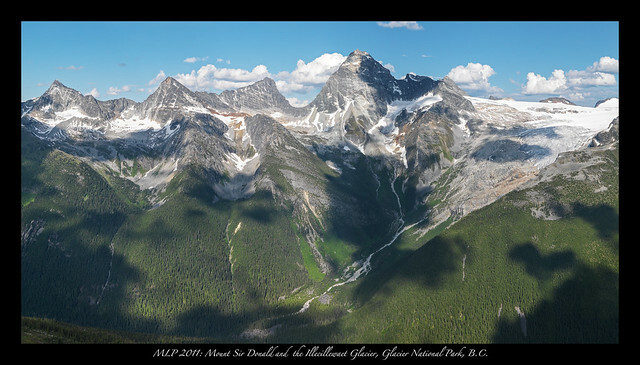 I have been lucky enough for the past few years to be involved with a dedicated group of researchers at the Mountain Legacy Project (mountainlegacy.ca) whose goal is to re-photograph as many of the 140,000 historic plates as possible. Most of my field work has been in the Rocky Mountains — a truly lovely area — but not the mountains of my heart. 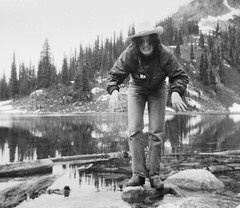 Growing up in Revelstoke BC, with Mt. Revelstoke National Park and Glacier National Park as my playground, the mountains of my heart are surely the Selkirks. Mt. Abbott on the left and Afton in the middle. The Bonney Glacier to the right. Even though Mike and I enjoy the mountains of Vancouver Island where we live, when our ACC Section announced that one of 2013’s mountain camps would be based at the Arthur Wheeler Hut (yup, the same guy), in Glacier National Park, deep in the Selkirks, we jumped at the chance to join in. A week rambling in my favourite mountains was just the way to end a summer spent in the alpine. And, our very first hike of the week was up Mt. Abbott via the ridge. In 1901, when Wheeler was assigned to survey this area, he would have travelled up much the same route as we did — making his way out of the interior cedar and hemlock forest into Engelmann spruce and subalpine fir around Marion Lake, and finally up into alpine tundra along the ridge. Wheeler’s goal was not the peak of Mt. Abbott. His control point was somewhat lower. He must have selected it because of the spectacular view it commanded. 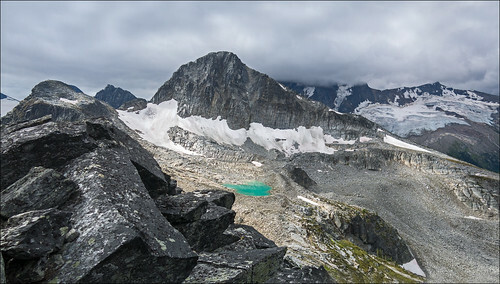 He took images looking south west towards Revelstoke, north towards the Hermit group, and east toward the Sir Donald group. This last image set, shown here, is my favourite — the differences between Wheeler’s 1901 photo and the 2011 repeat are astounding. For example, look at the extent of the Illecillewaet Glacier (on the right in both images) in 1901 compared with 2011 — certainly a huge retreat. I was pleased to make it up to Wheeler’s Abbott ridge control point, thinking what a march it would have been for Wheeler and his crew as they schlepped 25 kilograms of camera, tripod, glass plates, and survey equipment with them. My own pack was heavy enough! However, Mike and I went on past Wheeler’s control point and gained the summit of Abbott after a wonderful scramble amongst huge chunks of granite. 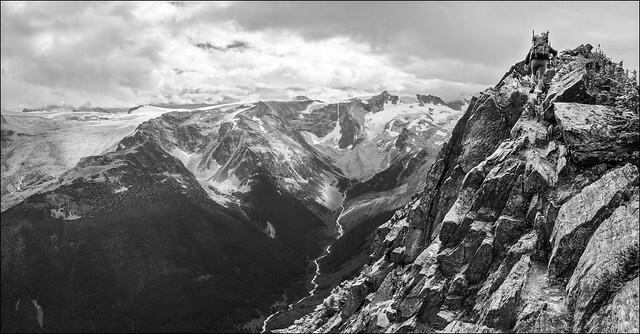 Glaciers, neves, icefields, and high ridges opened out in front of us as we ascended. Some in our group continued from the summit of Abbott on to Afton, but Mike and I decided to return back via the main ridge. I had fun scrambling down some of the airy steps I used scrambling up! All in all an excellent day spent with a fine group of folks in some of the most glorious mountains in the world. 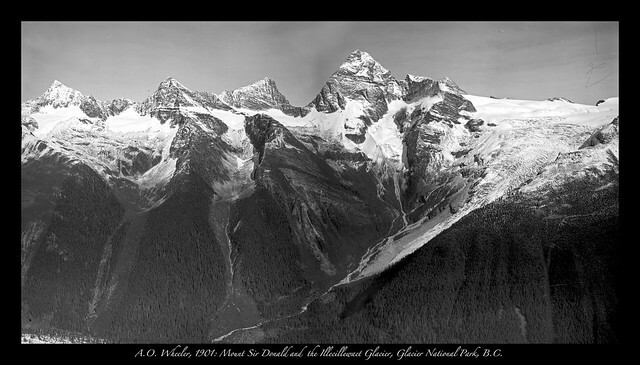 I think Arthur Wheeler would have been proud of his legacy — not only as co-founder of a club dedicated to preserving and promoting Canadian mountain culture and self-propelled alpine pursuits, but as the creator of stunning photographs that let us look back and compare today’s mountain environments with those of over 100 years ago. Here’s to you Arthur, and to the other mountain surveyors whose work all those years ago informs us so eloquently today. Like almost no place else I know, rambling in Mt. Revelstoke National Park lifts me up, slaps a happy grin on my face, and makes me glad to be able to put one foot in front of the other. Okay, so it’s not full of 3000+ metre limestone monsters like the Rocky Mountains, or huge ice sheets like the Jasper Parkway. Indeed, if I drive to the summit and hike back to Miller and Eva Lakes I only put on about 400 m of elevation change over 12 km total. But I get a sense of accomplishment every time I lace up the boots and head for the summit. Maybe it’s because Mt. Revelstoke is “my” Park in the way no other place be. For me a hike here is more than a day in the hills, it is a rendezvous with memory. Revelstoke is my home town and the Park was my playground. It’s a place of “firsts” for me: first place I put on skis – the old Mt. Revelstoke ski hill below the Nels Nelson ski jump; first place I climbed – up in “the Valley” with Bud Stovell and the Revelstoke Secondary School Climbing Club; first place I got well and truly lost – exploring the south eastern slopes with Don Daem. My first real alpine mountain hike was here too: My Dad (Louie), Don, and I hiked in to Miller and Eva Lakes in 1972. I saw my first grizzly in this Park, and had my one and only view of a wolverine in the wild at Lower Jade Lake while on an overnight trip with Mike in 2006. I also charge Mt. 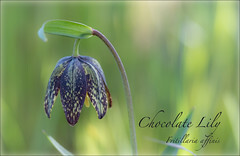 Revelstoke with developing my never-ending fascination for photographing BC’s native wildflowers. Established on April 28, 1914, Mt. 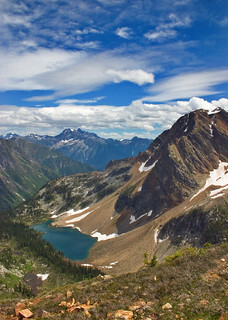 Revelstoke is Canada’s eighth National Park. The good folks of Revelstoke began working on the road to summit two years earlier, but it wasn’t completed until 1927. A trail to the summit was established in 1908. I’ve been on that hike several times, and I have to admit, one has to be rather “focused” to get it done — 10 km, unrelenting uphill, almost all in the trees — but the “Meadows in the Sky” at the top of the trail are glorious. I always count a summer with a trip to Mt. Revelstoke National Park as a success. This year Mike and I had the pleasure of introducing this lovely little gem of a park to Krista, Cedric, and Diane, friends from the Alpine Club of Canada – Vancouver Island (VI) Section. In late August the Section based a week-long summer camp up in nearby Glacier National Park. The five of us decided to drive down to Mt. Revelstoke and do the Miller and Eva Lakes hike (see map below). No one regretted the choice. 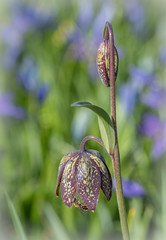 Even though the outstanding displays of wildflowers were past their peak, we still had a stunning day. Miller Lake was the first destination. Needless to say, going for a dip in its aquamarine water was the first objective. Some skinny dipping was included as we pretty much had the place to ourselves. Lunch and sunning on rocks followed in short order. Three of us decided to visit Eva Lake and meet up with the other two on the main trail later. 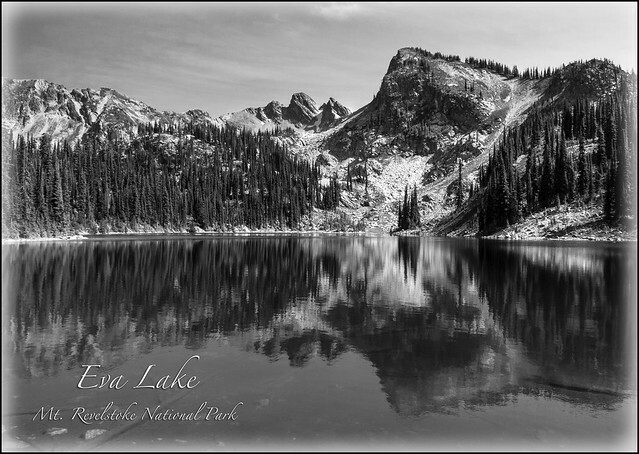 Whereas Miller Lake lies in a talus-scooped bowl, Eva sits up high on a small plateau and commands a fine vista of the area. 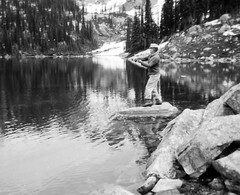 Both of these lakes have always been popular destinations for hikers and fishers, but my Dad always claimed the fishing was better at Eva. All in all, a trip into Mt. 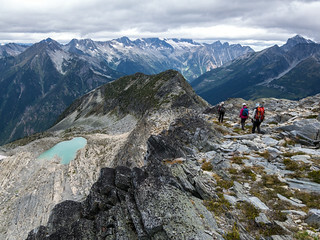 Revelstoke National Park is sure to provide experiences, views, and adventures that will morph into memories. I know I’m looking forward to getting back there next year — if I don’t do anything else, at least I can rendezvous with another skinny dip in Miller Lake! More pictures from Mt. 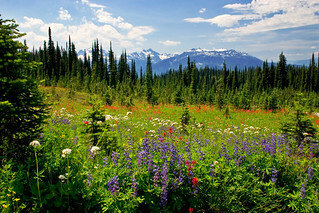 Revelstoke National Park here. Bigadore's Photostream on Flickr Alan’s pictures from all over. Darwin Sound Sailing Adventures with Al, Irene, and the Whitney Crew as they sail to exciting places. Travels with John and Lisa Pictures from John and Lisa.